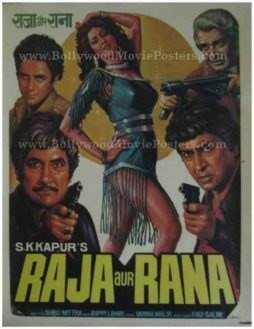 Original Bollywood poster for sale of the Hindi film, Raja Aur Rana (1984). 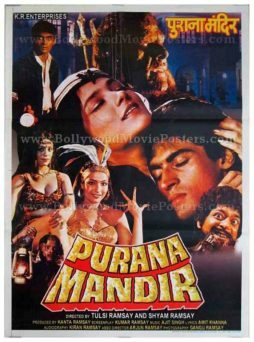 This is an actual surviving original Bollywood movie poster of the 1984 Hindi film that starred Pran, Aaloka and Puneet Issar in prominent roles. Printed and circulated during the first release run of the film (somewhere in the early 1980s), this original Bollywood movie poster was designed and printed for publicity of the film but never ended up being used. This old Bollywood film poster for sale was originally designed in hand painted oil on canvas format by a leading Bollywood poster design studio called Loombarts. 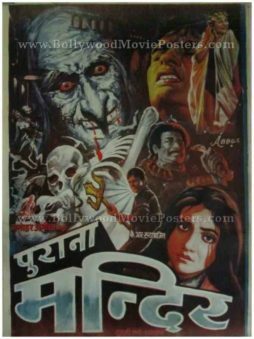 A printed signature of the art studio is seen on the bottom right hand corner of this original Bollywood movie poster. Lead actress Aaloka is seen in a sensuous dancing pose prominently at the center. The male actors appear on the sides holding guns, which is typical of the dramatic design techniques used in old hand painted Bollywood movie posters of the past.